A charity organization, Crimestoppers have warned victims of online job scams lose an average of £4,000. “Some victims have even turned up to workplaces expecting to start their new job – only to find out that the employer has never heard of them,” the charity warns. The most likely victims are younger job hunters – because they’re more likely to search online – and the long-term unemployed who want a job so badly that fraudsters find them an easy target. An out-of-work oil industry logistics expert Alan Winks was overjoyed that his years of experience in the North Sea had paid off when he was offered a job with Shell in Nigeria on more than £10,000 a month. 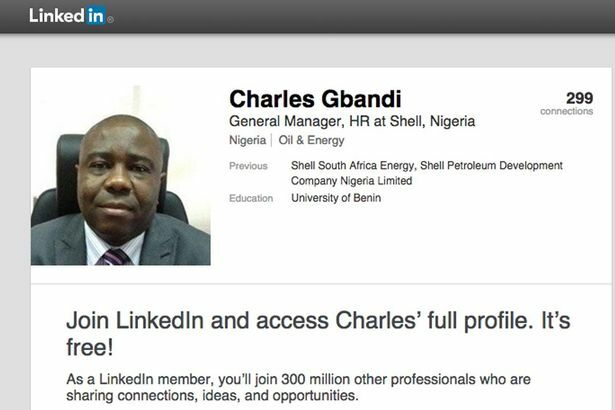 Mr Gbandi also wrote to Alan on Shell letterhead and had a LinkedIn page apparently confirming his position at the company. But it was a sham designed to get Alan to pay for fictional costs such as immigration and insurance expenses. Alan’s near-miss is not an isolated incident. Shell says it is “inundated” with queries about bogus job offers. “It has come to our attention that scam artists are impersonating senior Shell officials using fake Facebook , Twitter and LinkedIn accounts. “Members of the public are hereby strongly advised to note that any communication or correspondence via social media offering business contracts, ­scholarships, interviews or immediate employment, requesting payment at any point, is fraudulent and does not originate from Shell.